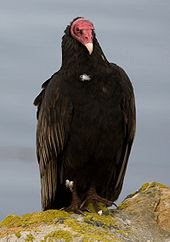 My awesome deductive skills have lead me to believe that the huge birds we've seen flying around are not Jersey Devils, but Turkey Vultures. 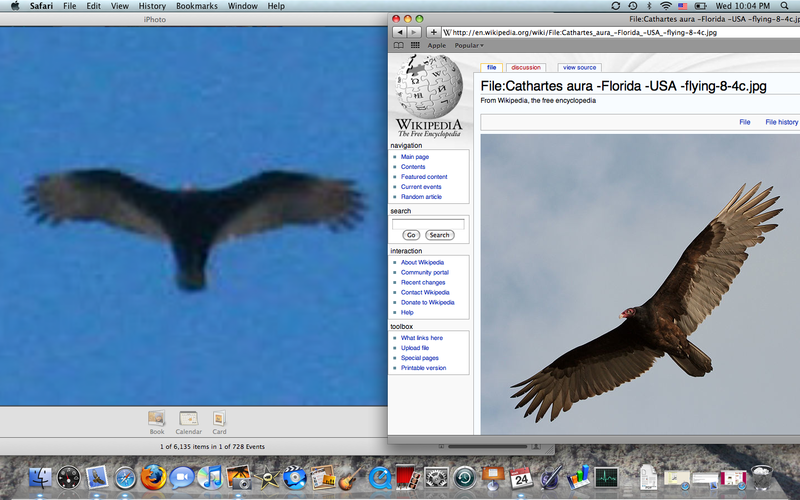 Here's a screenshot that compares a picture that I took and one from Wikipedia. What do you think? Vance and I have become maniacs looking at these birds - we saw 4 the other day at the same time. It's apparent that we need better equiptment, as we've been relying on his broken, toy binoculars to check them out. They're big and creepy and I don't remember seeing them last year around here. And ugly! Yeesh, those bright red faces! We always see a ton of hawks around here and have even had a couple land on our fence. They seem so cute and cuddly compared to these monsters. i think they are just big eagles. I'm not buying the turkey vultures. I did like that soccer post. Those are some ugly birds!!! Your mom and I saw one in Florida getting a snake in the landscaping. Have a good day!! turkey vultures look like the devil if he looked like a bird of prey.